Based on Helen Tse’s family memoir recounting the inspiration behind her Sweet Mandarin Chinese restaurant in Manchester and the three generations of women who made it happen, you could be forgiven for thinking that this was an advert masquerading as a play. 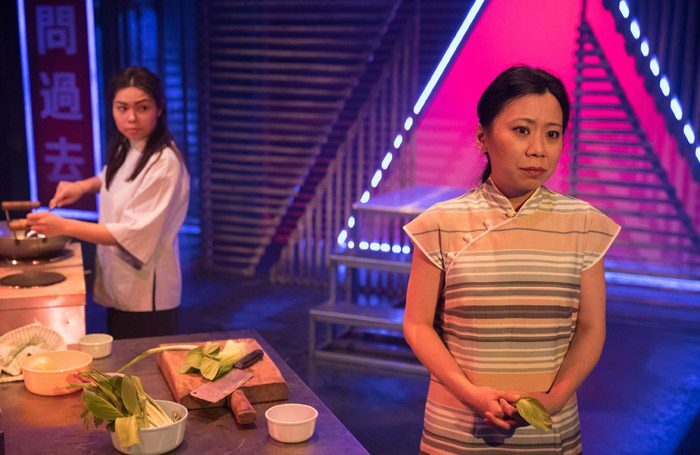 But, despite the cookbooks on sale in the foyer and restaurant’s famous green chicken curry being cooked onstage, director Jennifer Tang has crafted a production that stands up as a vividly realised theatrical experience in its own right. In-Sook Chappell’s cleverly structured adaption has the love of food at its centre, but this is no rosy-spectacled nostalgia trip. We follow Siu-See Hung’s successful but unfulfilled lawyer Helen as she visits her grandmother’s birthplace in Hong Kong for the first time. There an apparition of her ‘popo’ Lily (Tina Chiang) transports her, Christmas Carol-like, from the bustle of modern Hong Kong – arrestingly conjured up by Amy Mae’s neon lights, Elena Pena’s sound and movement director Lucy Cullingford’s fluid corralling of the seven-strong cast – through her tumultuous past. The story then moves back and forward through the years, as Lily fills in the gaps in Helen’s knowledge of both her family and East Asian history, but never loses its sense of time and place. Some scenes – such as when Lily witnesses the brutality of the Japanese occupation of Hong Kong first hand or is forced to give up a child for adoption – are hard to watch, but the authenticity of the details and the warmth and conviction in which the scenes are played makes for a compelling journey.